Get the Vines and Ground Covers Off of Your Trees! Vines should not be allowed to grow in trees. In the tops of trees the vines reach out beyond the tree leaves and block the sunlight. With sunlight cut down, photosynthesis is reduced and tree health suffers. 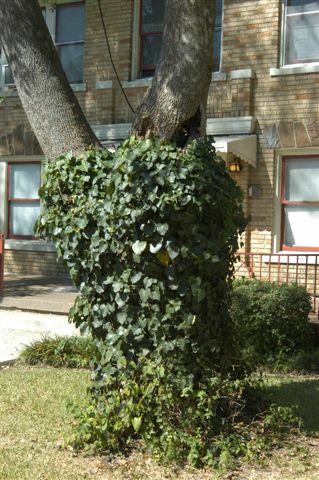 English ivy and other clinging vines are also a problem on trunks of trees. The foliage and stems collect organic material in the form of loose bark, dead leaves and dust. This mixture creates soil that collects in crotches but worse builds up on the root flares of trees. Long term this creates a condition similar to trees being planted too deep in the ground. Girdling, rot and even death can result but at the very least tree health and growth are reduced. Some people say it’s okay to leave these plants on the trunks of trees. Their advice is very bad. 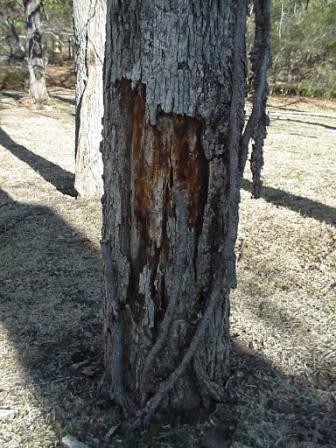 Damage caused by vines growing on trees. organic forums, videos and the DIRT publication, you can Join the Ground Crew. A portion of your membership supports the Texas Organic Research Center. click reply & put Unsubscribe in the subject line.